I am getting a bit slack on updating our blog. However I have finally got round to writing something new. Today I write with a definite spherical theme. 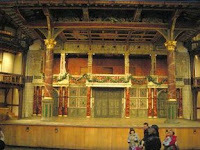 The rest of the weekend we played “tourist” and visited the Globe Theatre and the Tate Modern. 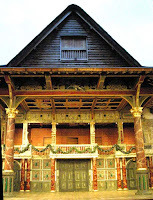 The Globe is a fantastic place, A reconstruction of William Shakespeare’s original Globe theatre in the 1500s. It has been faithfully reconstructed using traditional methods and techniques. From afar it appears a little out of context amongst the buildings of modern London but that contrast helps to accentuate the difference made by time. Alongside the Globe is of course a building that represents the industrial age. Again this is a building that has been rebuilt but with a totally different use today than it had 80 years ago. Now it is known as the Tate Modern. It is a huge space ideal for showing large pieces of modern art. This is accessed from the north bank via the infamous Millennium Bridge. I can certainly say that it no longer wobbles. Unfortunately we did not get any photos of Tate Modern but have vowed to go again and spend some more time there. We had a great time back in a “proper city.” There seemed to be a real buzz around London. Perhaps after working there for so many years the “novelty” had worn off. However on returning after a few years the “magic” seemed to have returned. One thing that hadn’t changed was the weather. Windy, wet and grey. It was also a nice feeling to get back home. Here it had snowed again and our village looked like a Christmas card. The slopes are in perfect condition and we can now get out skiing. Hooray! Mountain bike instructor,living a happier simpler downsized life in the mountains. Climate care - offset your travel. It is the least you could do! The Via Alpina. Walk or ride the alps! UK Say no to drugs in sport! Kent Benson 2011. Theme images by zbindere. Powered by Blogger.